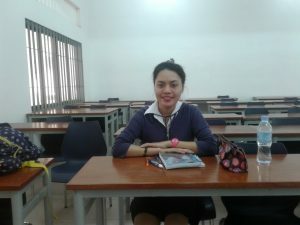 This is the second blog-post from Esther Tot who received the ESOMAR Foundation Scholarship to study at the English based Bachelor Degree program in International Business at the National University of Management (NUM) in Phnom Penh, Cambodia. Who says education is easy? If education was easy there wouldn’t be many students who quit school. Education is hard, and Yes! Really hard but it is valuable and precious. I remember my marketing class with Ms. Sopornetra. In her class there were a lot of assignments and yes it really was hard for me and many students. We had 3 assignments per class including a presentation and, every time during her class, all the students were required to wear a business suit or, you can say, a marketer suit. First of all, to be honest, I was not really enjoying the class much but later I found it so interesting because she gave us a real experience to practice as real marketers and business people and we learned how to do a good presentation with customers or our business partner to convince them to invest in our company. The most interesting part was the assignment of creating our own event as if we were real business people,. The event is coming soon this August and it will be attended by 800 people. The hardest thing is that in my afternoon session together with 16 students we must find cash or coupons sponsors for $1500 US dollars to support the whole event. But one catchy word I remember from my teacher is that “Nothing is impossible to do if you really want to do it” and this word keeps running in my head and I keep on telling myself that I can do it and I am going to succeed, we are going succeed. Nevertheless, going back to the part about the assignments and presentation: It was so stressful because we had to stay late at night to do the power-point slides and the next day we had to do a 10 pages report and I seriously thought: “why does she have to put so much pressure on us?” But the answer that comes straight in my head is that it is a self-discipline. She does this because she wants us to know and understand that when we step up in a real marketing battle this is what to expect. It could be a success or a failure so we have to learn and be ready and also we have to think of any alternatives in case something bad or good is going to happen when we enter the marketing field. There are competitors, and if you are not smart enough to understand the insights you will surely fail your business. So in business and market research we have to really understand our competitors and learn about their strengths and weaknesses because if you know what they have or what they lack you could increase your product sales. If they lack something, your company should see an opportunity, and if they have similar products to your company we have to quickly learn about them, strengthen our product and upgrade it to make it better than their product to convince the customers to buy our product. We have to ensure that our consumers love our product and want to be a long term user of our product. Our Christmas Charity Draw is now open! Become a prize donor!